Interested in volunteering your time at the fire department. Since all of our members live within the district, chances are, you already know someone on the department. Come by and see us. If you are interested in joining our department, you first need to come to one of our weekly fire meeting and meet us. 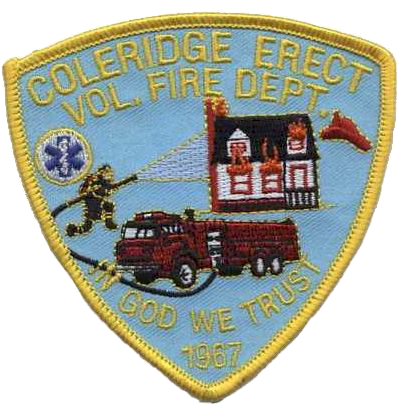 Generally fire meetings are held each Tuesday at 7:00PM and alternate locations between Coleridge and Erect fire departments. To join the department as a junior firefighter, you must be at least 16 years old, have a valid drivers license, be currently enrolled in high school, and live within the Coleridge-Erect Fire District. Junior firefighters are somewhat limited as to their role in the fire department. These restrictions have been implemented with the safety of our junior members in mind. For example, a junior firefighter will not be allowed to enter a burning structure, drive emergency apparatus, respond to calls emergency traffic, etc. Junior firefighters can be promoted to Firefighter when they meet the requirments below. To join the department as a firefighter, one must be at least 18 years old, have a high school diploma, have a valid drivers license, and live within the Coleridge-Erect Fire Department district. When you come to your first fire meeting and express your interest in joining, you will be given an application. You must fill out the required information and return the application to an officer of the department. In addition to attending 4 meetings, you will also meet with our Screening Committee, which is made up of 4 officers from the department. The committee will simply ask you questions to get to know you better, and then offer a recommendation to the department on your behalf. The final decision to make you a member of the department will be by a vote cast from the current members of the department.